Enthusiastic friends Patrick and David decide to grow their very own Sea Serpents and order a kit from an advert in a comic book. When nothing much happens except a noxious smell, they dump the entire lot into a drain and forget about them. However, the Sea Serpents thrive in the sewer and emerge as fully grown monsters who wreak devastation on the local population. 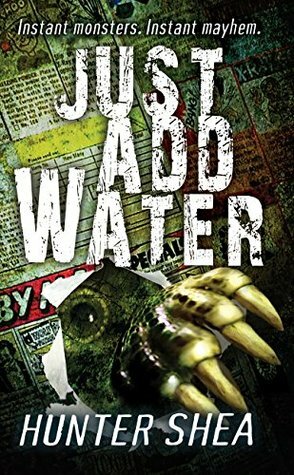 Just Add Water is a great little novella which reminded me of those fantastic creature-feature horror stories I read as a teenager in the 1980s. Yes, there are graphic descriptions of blood, gore and mutilation but it's all very tongue-in-cheek and you can't help but laugh and get carried along by the ensuing craziness. The 'weapon' the boys use to fight the Sea Serpent-monster-thingies is totally hilarious and had me rolling around emitting huge guffaws of laughter. Brownie points to author Hunter Shea for dreaming that one up! This novella is a great way to spend an afternoon and I'd recommend to anyone who loves a slice of comedy-horror. My thanks to Hunter Shea, NetGalley and Lyrical Underground for providing a copy of this book. GROW AMAZING LIVE SEA SERPENTS! Just add water . . . and watch them grow! Just ask David and Patrick. Their “instant pets” are instant duds. They don’t hatch, they don’t grow, they don’t do anything. So they dump them into the sewer where Dad pours toxic chemicals . . .
It’s been years since David and Patrick thought about those Sea Serpents. But now, small animals are disappearing in the neighborhood. Strange slimy creatures are rising from the sewers. And once the screaming starts, David and Patrick realize that their childhood pets really did come to life. With a vengeance. They’re enormous . . . and have a ravenous hunger for human flesh . . .